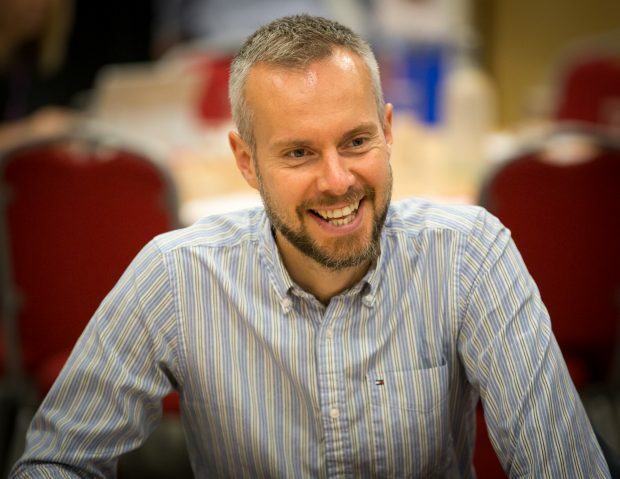 Hi, I’m Jon Osborn, head of business analysis in DWP. 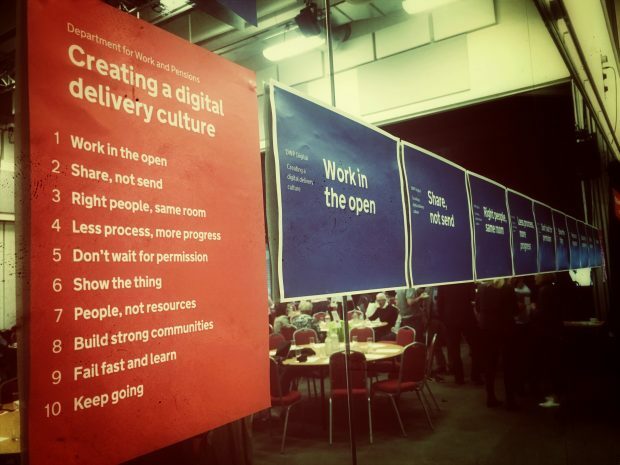 I recently co-ran a breakout session for DWP Digital’s leadership community looking at how we are building a digital delivery culture in DWP. 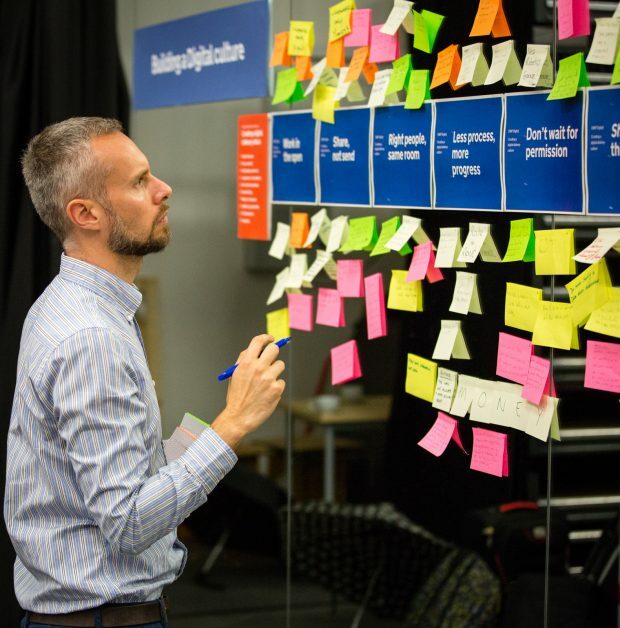 We focused on 10 practical things we are doing (and can do more of) within our teams to make digital something that we are, rather than just something that we do. This means being prepared to be open and transparent both inside and outside DWP. 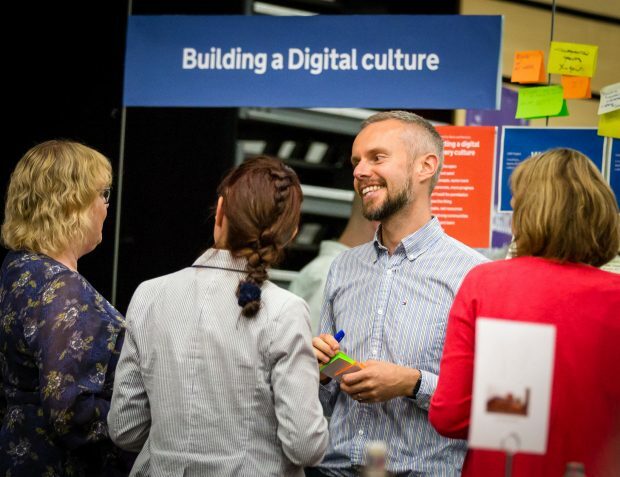 It doesn’t simply mean using Twitter – it’s about encouraging teams to talk about the work they’re doing, the digital services they’re delivering and why. Thinking in this way makes us more invested in them and more accountable for what happens as a result of those services. This is a simple concept, but unlike working in the open it’s a harder change to make. It’s about breaking that reliance on email and creating a more collaborative and trusting environment. Getting everyone together around a white board, for example, helps build shared understanding and means everyone is on the same page. This is about getting the right people in the same space or involved in the same conversation. Thinking wider than your immediate team and working through problems collaboratively is key. This is even more important in digital projects where user-centred front-end services need to be fully aligned with back-end processes and teams. Sometimes in DWP and wider across Government we focus too much on the process and too little on the outcome. To change this, product design teams need to spend a lot of time working with service teams to truly define problems and measure progress towards meeting user needs through the services we deliver. Seeking forgiveness, not permission doesn’t mean being reckless – it’s about being empowered to take measured risks. For example, to improve the user experience of the DWP jobs board Universal Jobmatch, the team set up a (now blue-tick verified) Twitter account to answer simple queries. As a result, call volumes dropped allowing agents to focus on more complex issues. Had the team asked for permission to create the account, the answer would likely have been ‘no’ – instead they proved its success in both monetary savings and enhanced user experience. This ties in beautifully with working in the open; fundamentally it’s about being passionate about showing what we’re doing, showing that we are delivering things and joining up separate pieces of work. By doing this we’re building a shared understanding and building outcomes for users. When we talk about ‘resources’, we really mean ‘people’. The language we use as an organisation really matters – in reality it affects the decisions we make and the way we approach our work. The emphasis we put on language drives outcomes. That’s why we talk about user research over user testing – we’re not testing our users, we’re testing our designs against how well the users’ needs are met. Academic studies show the value strong communities at work can bring. At DWP Digital we recognise this. In my own business analysis community, we held BA Awareness Week, which blended training sessions and networking to support internal up-skilling and community building. The event was so well received because it was shaped by the community it was looking to serve. We had record engagement and the networking opportunities created valuable and long-lasting relationships for people to both receive and offer support. If you can demonstrate why something didn’t work and more importantly what you learnt from it and why you are not going to make the same mistake again, it was a positive outcome, right? It is crucial to us improving the way we work; we must get better at talking about our learnings through failure. We say this a lot in DWP Digital. What we’re doing isn’t easy, and it takes real discipline to come into work every day and question how you do your work, to question how you’re leading your teams and to question what you as an individual are doing to help shape your teams and the wider culture. Only by leaders actively taking these small steps, and encouraging and empowering our teams to do the same, will we fully develop the culture we aspire to have. Cultural change often fails as organisations try to transform large-scale – better results come from a few small successes that are built upon gradually over time.